Recently, my plumeria began to grow two seedpods. If you have noticed your plumeria doing the same, continue reading. I will guide you, from start to finish, with what I had to do with my Plumeria pods. Remember, this process does not happen over night. It will take about 9 months for the casings to crack open. Throughout the entire process you are going to need plenty of patience. The patience part is very hard for me but the end result is well worth the wait, I promise. 1) The seedpods will look like two green beans. When they first start growing, they are green in color. As they grow and mature, they will slowly turn brownish-black. From the time they start growing to the ending of their growth, they may reach 7 inches long. While in the beginning stages of development (green), leave them alone. 3) By early spring, the pods will begin to open. Once they have opened, your wrapping will catch all the little seedlings. With mine, one had opened and the other one was cracked. After several days of the cracked pod not opening all the way, I decided to carefully open it myself. *Remember..... 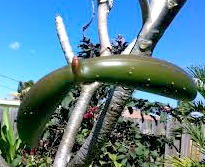 If you remove the seed pod during the growth period the pod will die and it will not produce seedlings. Seed pods usually will not grow during cooler months. The tropical plant goes dormant those months. 4) At this point, you may either store or plant the seedlings. You can read my page on planting a plumeria seedling for further instructions. HINT: Some plumerias may constantly grow seedpods, while others will never produce one. Remember to get the seedlings at the end the pod must stay on the tree! When seedlings are produced, they are not always the same color as the parent. This is one of the reasons that I enjoy working with Plumerias. For example: if you have a yellow flower you may receive one that comes out red. New types of species….. Once you start collecting it, it might be hard to give it up. If you have grown a new species you may register it and name it. 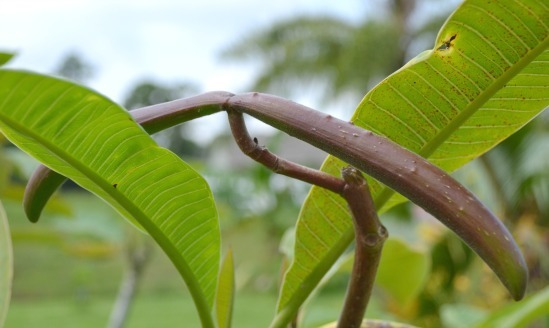 Under the right conditions, seedlings will grow faster than a plumeria cutting. This is all due to the proper start of their root system. The blooms may appear quicker from seedlings, sometimes in as little as two years. 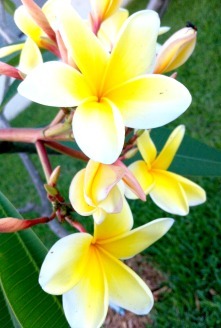 Growing Plumeria's In Hawaii and Around the World is one of my personal top picks. 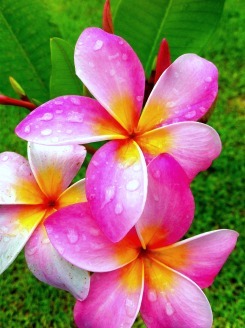 Not only is the book easy to read but the author included some exquisite photos of plumerias. Even after years of growing these tropical plants, I find myself referring back to the book. Plus..... I learn something new every time I open the pages!